Have you ever hit a lull in your business? It can be frightening. It can cause panic when you don’t know where your next job, client, or project is going to come from. 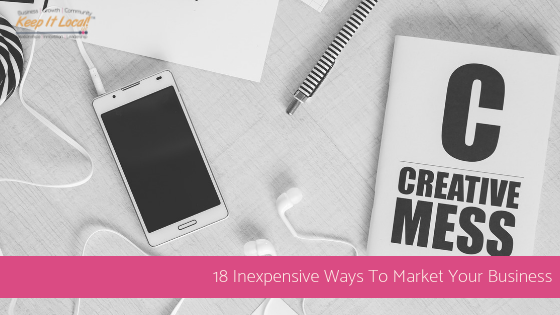 In this blog post, I will share with you 18 Inexpensive Ways To Market Your Business so you can always keep your pipeline in flow. Networking – it is the most effective, by-word-of-mouth advertising available. Volunteer to be a speaker in community networking meetings. Approach this without a selling attitude. The more you can help the people in the room by sharing free advice, the more you tend to position yourself as an expert and the “go-to” person in your field. Get involved in trade shows. Follow up! It’s time to pull out that shoebox of business cards hiding under your desk and follow up with all those people you were going to follow up with originally. Take this one step further and set up a follow up system for you and your business. Guest blog. Write an article full of value and ask your network partners if they would like to use it on their blog or in a newsletter. Create a downloadable or printable guide or checklist in exchange for an email list. Host a free workshop to help get your name and brand out there. Collaborate on a promotion or advertisement with other complimenting businesses. Start a monthly newsletter staying top of mind with your customers. Stand out in your industry and send handwritten thank you cards, birthday wishes, etc. Consider starting a podcast, it’s a great marketing tool! Facebook live is a great way to reach new people. Consider starting a weekly show. It only has to be 3 – 7 minutes long. Use this same strategy on Instagram too! Write an eBook and use it as a tool to grow your email list. Develop a customer referral program. Consider doing a “pop-up” at a non-competing business. What creative ideas do you have? Let us know about them!